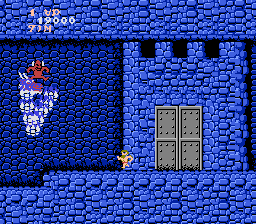 NES Ghosts 'n Goblins (USA) in 08:42.57 by Arc. This is the eighth improved (by 10.77 seconds) version of Jeff C's TAS of this hard game. Detailed information can be found in the author's comments. Although this movie was made with Famtasia, the author meticulously catalogued the frame count. Despite the game's appearing to be fairly straightforward, it requires a surprisingly large amount of luck manipulation. This game is known as Makaimura in Japan.